There are several different ways to render First-Person-View Items. The parts of the code that do this are summarised in the diagram below. The top level is EntityRenderer.renderHand() which calls ItemRenderer.renderItemInFirstPerson(). For non-block items (eg pickaxe), ItemRenderer.renderItemIn2D() renders the item's icon with thickness. If your item is a custom block, you will probably have given it a special Block renderType to render it correctly. In this case, you can add code to your custom Renderer which implements ISimpleBlockRenderingHandler.renderInventoryBlock(). 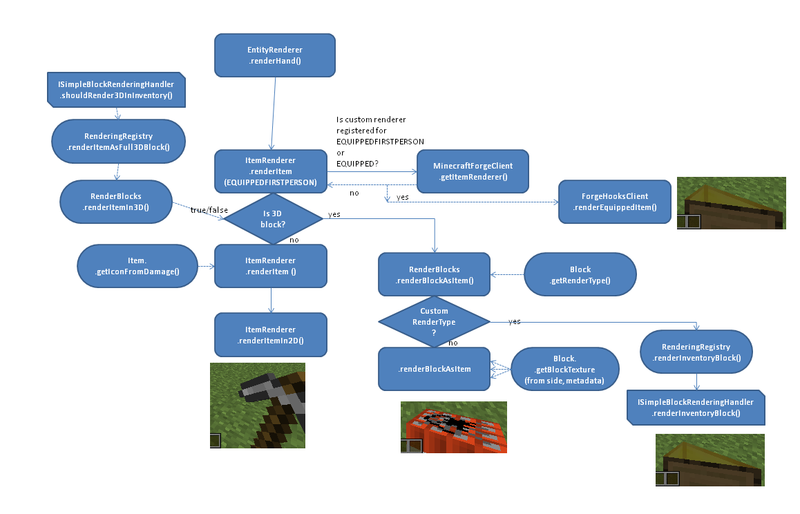 See .renderBlockAsItem for plenty of vanilla code showing how to render them. Use [-0.5, -0.5, -0.5] to [0.5, 0.5, 0.5] as the extent of the block, it has already been scaled, rotated, and translated appropriately. If you tessellate directly, do not forget to .setNormal() to match each face otherwise the lighting will look strange. (See .renderBlockAsItem). Different ways of rendering First-Person-View equipped items.